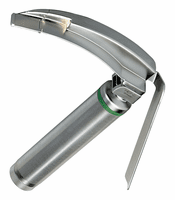 Scroll down to see our selection of Laryngoscopes for sale. Laryngoscopes We carry a large selection of Laryngoscopes in several different variations and styles, including some of the most popular laryngoscopes on the market today, such as the Macintosh Standard Blades laryngoscope, Miller Standard Blades, Standard and Fiber optic Laryngo Sets, Fiber optic Miller Set, most sets allow you to choose your blade size, so look through our selection of Laryngoscopes and choose the one that fits your needs best and order one today . What is a Laryngoscope? Laryngoscopes are a rigid or flexible medical device equipped with a light and magnification, for examining and performing diagnostic and surgical procedures on the larynx and may also be used to perform or or facilitate tracheal intubations for patients experiencing trouble breathing, and have been found to both improve upon and save lives throughout years of medical use..